It was another weekend FULL of Super Hits at Sports Cards Plus, a.k.a. The Super Hit Factory. I told you it was shaping up to be an EPIC week at "The Factory," and it was. See my last three posts. It took three posts to list only the BIGGEST hits this week. Chris came in Friday and tried a few boxes of Panini Prizm 2014 World Cup Soccer for ONLY $108 per box. Here he is with his Messi Autograph and Red, White and Blue Prizm. Mr. K (under Witness Protection) pulled a 2013-14 Panini Crusade (Only $66 per box) John Stockton Black Crusade 1/1. Mr. K also pulled this 2014 Topps Museum Collection 1/1 Hand Painited Original Art Johnny Bench Autographed by the artist. Next it was Tommy's turn to pull a Super Hit. He decided to try 2011 Panini Prime Cuts Baseball and 2013-14 Panini Court Kings Basketball. 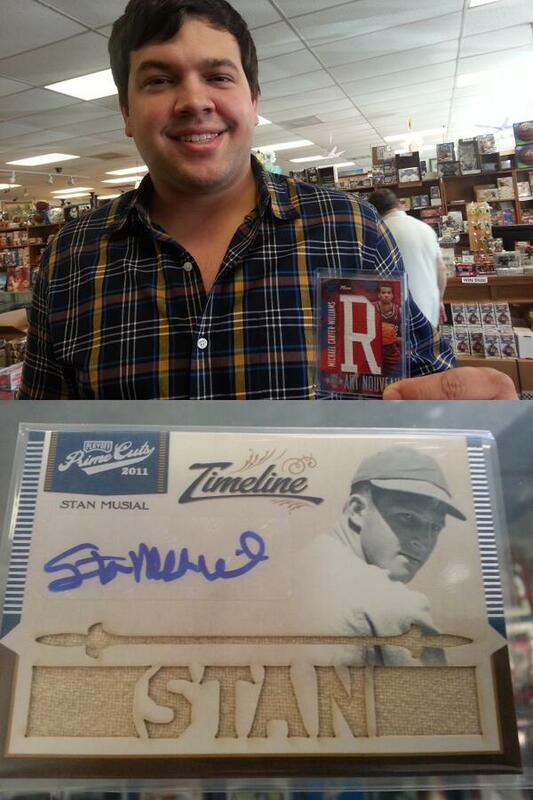 Here's Tommy's Stan Musial 2011 Prime Cuts Timeline On-Card Beautiful Autographed Jersey 1/3! Tommy is also holding his Michael Carter-Williams 2013-14 Court Kings Prime Patches 15/15. Ted came in to show us this redeemed redemption a 5 Auto Die Cut Pennant 14/15 from 2013 Topps Chrome Baseball. Autographs include Jay Bruce, Jean Segura, Anthony Rizzo, David Freese and Neal Walker. Dwayne came in to show us what he got back in the mail from Beckett Grading. This 2014 Leaf Metal Draft Johnny Manziel RC BGS 10 with 10 Auto doesn't happen every day. Beckett Grading will be back at Sports Cards Plus to do IN-STORE GRADING sometime in September. Butch capped-off the weekend with just one more 2014 Leaf Best of Basketball. Butch had already pulled TWO Michael Jordan Autos and a 2012-13 Panini Flawless Basketball Anthony Davis Ruby Red Auto RC 15/15. Butch knows THE BEST CASES in The Hobby are at Sports Cards Plus, so he thought he'd give our cases of "Best of Basketball" another try. Here is Butch with his 1/1 Hand Painted Original Art Michael Jordan Auto from 2013 Upper Deck Michael Jordan Master Collection. So, what are you waiting for? 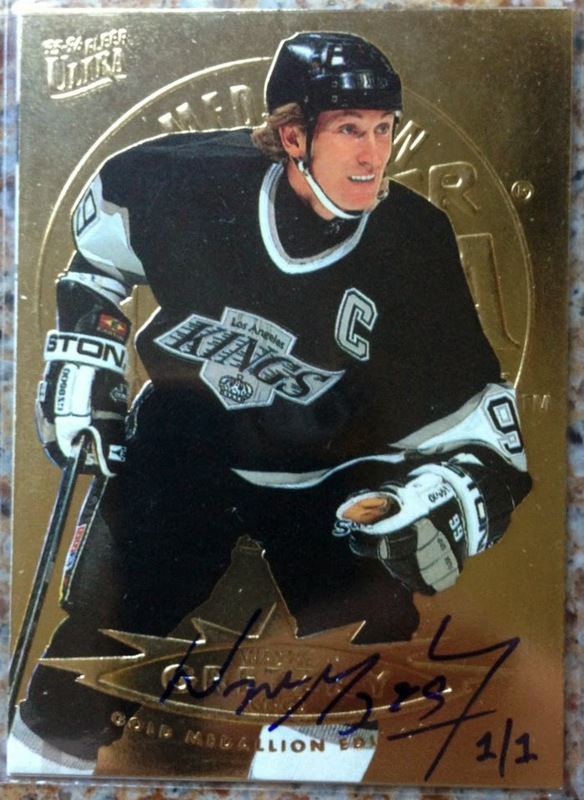 Come to Sports Cards Plus TODAY and continue The Legend.